BUILDING producer trust in value-based marketing systems, including elements like lean meat yield and offal value, is the next big challenge faced by processor Teys Australia as it moves along a pathway towards VBM adoption. 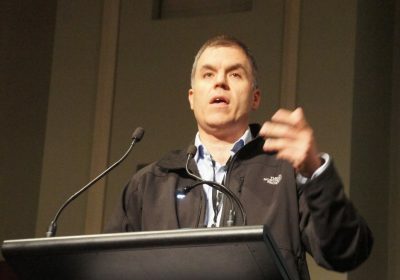 Speaking at the Angus Australia annual conference in Ballarat last week, Teys general manager of corporate services, Tom Maguire said carcase feedback on lean meat yield would start to filter back to producers in coming weeks, as the company continues to develop its vision to move towards VBM. Mr Maguire told the conference audience, mostly made of up of seedstock producers, that genetics would play an absolutely critical role in any industry gains in carcase yield that might unfold. Beef Central first wrote about Teys’ vision to move down the VBM path in this article published in October, 2015. Paving the way towards objective yield assessment, the first DEXA X-ray equipment installation will take place at Teys’ Lakes Creek plant near Rockhampton in Central Queensland, in a process that is due for completion by the end of July. The next installation would happen at Teys Wagga facility in NSW, Mr Maguire said. Once that is completed, the company would be in a position to very quickly prove the technology across different types of cattle and environments, and would then look at installation at other company processing sites. He said producers would shortly start to receive carcase feedback sheets with three additional columns, providing information on lean meat yield percentage, MSA index, and value-based marketing group. At first, yield information will be provided using a calculation based on an equation, but before long the objective DEXA X-ray technology will deliver that data. Mr Maguire stressed that the provision of yield performance information would not change how Teys currently pays its livestock suppliers any time soon. “There won’t be any move to changing payment systems for perhaps three years,” he said. “We need to talk a lot, to make sure all stakeholders understand what the feedback means, and are comfortable with it. It’s through these conversations that we can start to show what we do, to help you (producers) do what you do. If we don’t get the relevant information back to producers in a usable form, we’ve failed in our objective,” he said. “But we’ll be really excited to talk more with producers about the potential of genetics to improve performance in yield, and even potentially in areas like reducing dark cutting. Producer action can move the curve on yield, and carcase value,” he said. 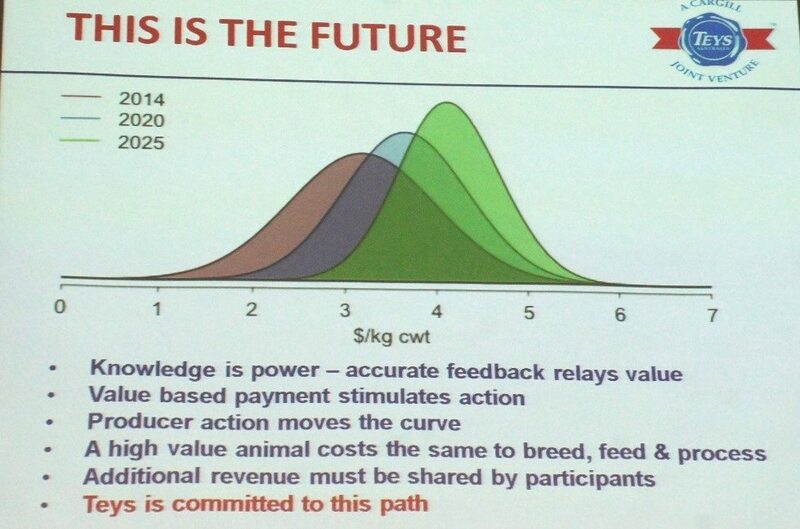 The ‘bell curve’ on current industry yield performance was presented in this graphic, together with a ‘tighter, higher yielding’ prediction that might happen by across the cattle population by 2025, based on the signals coming back to industry over yield performance. In simple terms, Value-Based Marketing was really about being able to communicate the true value of each animal sold to suppliers, Mr Maguire said. If real change was going to be made in the industry, it was important to have ‘lots of conversations’ about what was involved with VBM, to get the process started. First was the typical commodity cycle, where either processor or producer was doing well, while the other was not. That model was simply not sustainable. “We need more and more money invested in our industry by all stakeholders, and more stable returns are required in order to achieve that, rather than a roller coaster,” he said. That puts Australia at twice the cost to process grainfed cattle as North America, and twice the cost to process grassfed cattle as South America. Mr Maguire said it was a ‘real credit to leadership within the industry’ that people were getting out there and thinking about the future when faced with such challenges, and how the Australian industry can do things better – through developments like the DEXA objective carcase yield assessment technology. “If we don’t continue to make an effort to evolve, those challenges like competing proteins and cheaper overseas export competitors are going to start to catch up with us,” he said. Mr Maguire said at the centre of the VBM movement was the need to understand that every dollar producers and processors generated in their businesses ultimately came from the people consuming the product. But we are nowhere near achieving that, right at the moment. What currently happens is that all mobs of cattle coming into the Teys business, include a ‘normal distribution’ – some good, some not so good. “What the industry currently does is pay on the average. We don’t help you sort out what’s good or bad. But the actual performance of the individual animals is dramatically different to the grid average return,” he said. Mr Maguire displayed a graph showing real value of individual animals in a mob (including yield value) ranging from about 425c/kg to 600c/kg carcase weight – a variance of 175c/kg. Mr Maguire said current industry calculations of lean meat yield were only about 30pc accurate, meaning they were ‘not particularly useful’ for decision-making purposes on-farm. But Mr Maguire warned that the provision of yield feedback could not develop into a situation where producers ‘chased yield’, at the expense of quality traits. The pork industry, in the past, had targeted yield at the expense of quality, at considerable cost through consumer ‘push-back,’ he said. Animal health feedback, by way of offal condition, will be another part of the expanded feedback cycle being launched soon by Teys. Mr Maguire said the new DEXA technology – along with whatever other technology came along that was used to objectively predict yield – would be validated by AusMeat, using CT scanning as a calibration benchmark. An Angus conference attendee asked Mr Maguire how long it would take for the VBM payment model to spread across the industry – assuming the trial work and DEXA technology all proved reliable. “Ultimately producers should demand this type of stuff,” he said. Tomorrow: Are Australian slaughter cattle getting too heavy?